I was 15 years old when "Sheena is a Punk Rocker" came blasting over the radio and that moment fairly changed my life. At that point I knew I had to have a guitar and music became an addiction that has lasted my entire life. Sheena the guitar had to re-kindle that moment. No nonsense, no "features", just straight up delivery. The guitar had to be unique, as unique as the Ramones and had to have in-your-face, rock and roll audacity. Before the Sheena concept was hatched, the project started out as a single coil/humbucker Jazzmaster rip-off. I figured that was as good a place as any to start, so I started looking for body blanks. Like a little kid with stars in his eyes I wanted a highly figured piece of wood because I was sure this was going to be easy and I was going straight to the top in terms of guitar beauty. Never mind this was my first build. I stumped up 300 bucks for a beautiful piece of Queensland maple, which I later found out is second only to Superman's chest in terms of hardness. I then ordered some pickup and neck routing templates from Stew Mac and with a router from Bunnings I was ready to go. Within 15 minutes I'd destroyed the blank and was ready to throw it on the fire. Okay, possible exaggeration, but I learned more about routers in those first 15 minutes than probably the rest of the project combined. The humbucker route was WAY oversized as the template shifted under the router. The neck route came with multiple gouges as the plunge didn't quite go to plan. First, the Stew Mac templates come as individual pieces of varying thicknesses. The idea apparently, is to use double sided tape to attach them to the body, then route. The tape I used was strong but not strong enough, probably due to all the wood dust on the surface of the body. The tape has to be thin so that there's no vertical movement as you route and as the template moved, so did the router bit into my beautiful blank. Later, when I'd calmed down, I repaired the Stew Mac templates and created an all-in-one pickup and neck template on a piece of MDF that could be screwed to the body behind where the bridge would go and into the rough beyond the neck pocket. That worked perfectly on later builds but it still took two goes to make that properly! Routers are not faint hearted tools! The blank sat neglected and unloved for many moons before I came up with an idea to transform it. I didn't want to just cover the mistakes with a pick guard and I had already taken a chunk out of the neck pocket. But with a shift in the body shape to get around that and a solid idea for a semi-acoustic, (ho, ho, ho) the Sheena concept was born. The Sheena shaped traced onto the blank. If you look closely you can still see the original Jazzmaster outline. I traced out the body shape in a notepad and enlarged it on a photocopier to size. I cut that out of MDF and then cut the "hollowed" sections out making sure I kept the hollow sections for routing parts of the shape that were not the hollow parts. The more material under the router's base, the better. I then located the template on the blank, traced around it and cut around the line with a coarse blade on the jigsaw. By the time I got all the way around the body, the jigsaw was blowing seven different kinds of smoke and deserved a well earned rest. Did I say Queensland maple was hard? It could stop bullets. Then I attached the body template SECURELY, and cut to the edge with the router. I needed two router bits for that, one with a bearing on top to first follow the template and then follow the first cut and one with a bearing on the bottom to finish up from the other side as the depth of the wood was too thick for a one sided approach. ...otherwise this happens. Luckily the error wasn't too deep and I could correct the shape with a rasp and file. I mean, who knew??!! How many ways can this go wrong??? Next up, the hollows had to be carved out. It's best to remove as much material as possible with something cheaper than a router bit because good router bits are not cheap and they do a LOT of work, particularly in hard wood. A Forstner bit works really well for that so I drilled out as much wood as I could to lighten the load on the router bit. I had also done that for the pickup and neck routes. I don't want to know how many holes there are in that blank but I'm happy to say that none went too deep. While routing the hollows, one of the router bits gave up. Dramatically. It was easy to tell that something was wrong as soon as the bit failed, but not before significant damage was done. This was a cheaper bit. They are a waste of money unless you are routing balsa. Clearly, the Queensland maple won this round but the bit didn't go down without leaving it's mark... Fortunately this was on the inside of the body and could be cleaned up with filler before painting. I wasn't going to mess with f-holes for the semi-acoustic top when flames seemed like a much better idea. I had extreme difficulty finding a quality piece of 1/4' thick hardwood where I lived so I just used marine ply. That is a completely unsatisfactory solution in terms of workability (the edges feather, tools rip chunks out of the veneer, etc) but it was very good for prototyping as it was cheap! I drew two designs on paper, traced them onto the top, mirroring the design on one side. I used a jigsaw for the cut and extreme patience for the smoothing. The results appear below. I actually think the first design has sexier flames, but the second design is more in-your-face and showed more of the interior so I went with the one on the right. I used 9 ply for the top because I didn't want parts of the flame cutouts snapping off and because of the thickness, the control posts wouldn't fit through the body. Lucky I thought of that before I glued the top on. I used a couple of bits and a chisel to create a seat for the volume control pot so that the shaft extended through the body. Then lined everything up and glued the top on. Then using the router bit with the bearing on the bottom (there must be a proper name for that...), I ran the router around the body to remove the excess from the top that had just been glued on, including the excess over the neck pocket. 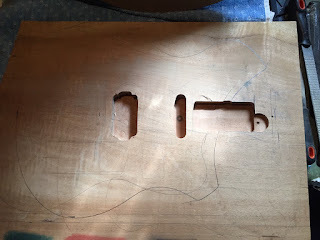 Now that everything was aligned and seated, I carefully lined up the humbucker router template over where the original humbucker route was (which I could no longer see) and dropped the router into the hole, hoping for the best... The gods were with me that day as the route came out perfectly over the original hole. There are a considerable number of measurements involved in the placement of the hardware, so it was good to see consistency in my approach. However, the elation from the successful humbucker route was soon tempered by the next problem. I then unscrewed that piece and glued it into the neck pocket. Now the neck pocket was too shallow, which is exactly what I wanted, so I set the router to the correct depth and routed out the neck pocket back to the correct depth. Problem solved and routing finished! back to the correct depth. some soft rags into the "f-holes" (flame-holes??) to mask the red of the interior. At this point all the hardware had to be fitted including the tuners, all holes drilled and the whole thing pre-assembled so that no new little issues would arise after the paint had been applied. I bought tuners that suited the style of the guitar, fitted them and then attached the neck. Once that was done I had to make sure the guitar was playable. So far, so good, so the whole thing was stripped down and readied for paint. straight, drill the fixing screw holes and all the skulls were happy. The bridge positioned, installed and strung showing the humbucker cavity. There is some excess on the string saddle posts, that will have to be ground off from the bottom... The whole thing feels very solid. applied with an acrylic spray can. Then the flame holes got their lipstick. couple of water based skin tattoos. Finally, the body got 3 coats of a clear two pack spray and was left to dry. Hardware was put back on, electronics connected up (pretty easy, only one volume control...) and the guitar was ready for final set up. I managed to get 8 skulls on board! The guitar is heavy. Looking back I could have taken at least an extra centimetre off the outer edge of the hollows and probably some extra meat off the tail. Queensland maple is very strong, it could have handled it. Queensland maple is too hard for a guitar body. Probably too hard for a tank body. It's heavy, it destroys tools and as soon as the tools lose their edge the work suffers gouging and chunk blow outs. There's no reason for the body to be that hard and it made the build that much more difficult. You can't use plywood for tops on semi-acoustics. The veneer feathers at the edges, there's a deep grain in the veneer that is not easy to sand out and you can't get a fine edge as tools rip chunks out. You need to use a sheet of wood. That may not be super easy to find but it would make the build infinitely easier. Gluing 3-4 sheets of thin wood planking on edge would have been better than the plywood but I probably would have need a proper thicknesser to clean that up and each flame hole would have had to fit entirely inside a single plank. Most of the hardware I've sourced from China Vegas has been of inconsistent quality and really, a gamble. Some pieces are high quality while others are poor. There are gems however, I did find a quality router bit supplier that is substantially cheaper than local prices. All in all though, it's better to spend the money on Japanese or German hardware. The machine heads on Sheena look fantastic but they are locking tuners and the locking pin is capable of snapping a D string if you over tighten it. That's never happened to me with Schallers. As a side note, a lot of local parts suppliers just source their parts from China anyway, but at least there's some level of quality control between you and the part, or so you'd hope. Chinese necks are very much a luck of the draw proposition. All three necks I bought had flaws so they are effectively selling seconds. The neck needs to come from a US or Japanese manufacturer which means $$. Paint is not easy. You need to sand the wood back to glass smooth. Paint on a generous coat of primer/sealer. Sand that back to glass smooth. Then it's just two to three light coats of colour and two coats of clear. More coats is NOT better. You also need a proper stand that allows you to paint with the spray can upright for the face and back of the body. Follow the instructions on the can re distance from the job. Different paints dry more quickly through the air and you don't want dry paint hitting the job. Do the second coats as soon as possible after the first so that they meld together. Wait between the colour and the clear coats. Auto paint is excellent, particularly the pearl or mica finishes. Standard acrylic does not dry as well and is not glossy enough.